Hi, i bought a friend a nepenthes bloody mary (ampullaria x ventricosa i believe) and its been doing fine however hes worried as the last week or two the leaves and pitchers have been going dark brown black. I said not to worry as my otherwise healthy bloody mary is crisping and dying off both leaves and traps its just naturally dying off but after he sent me a photo im not sure. The leaves that are dying on his are very dark to my brown and i noticed his new growth in the middle is suffering aswell. If anyone has any idea (see photo) id be grateful for some advice.......new to this site, how can i post a photo? Moved your post to its own thread, it will get more attention here than as a reply to a post from 2013. To post photos scroll down past the "submit reply" button and click on "manage attachments" in the pop up window click "add files" in the upper right then "browse" select the photo and click "open" (you can repeat the browse-open to add more photos). That window closes back on the old window click "upload". Once you see the photo show up in the bottom pane, click "done" and the photo is added to your post. Good morning guys, i apologise im a bit slow on this thread, ive got some more pictures ill upload with this. Can anybody shed any light on what its ailment might be from these? It must be situational as its the same species which is planted in the same medium (original carnivorous compost it came in then surrounded by sphagnum moss) as i have two of which are flourishing. Hopefully the pictures are thorough enough, any help is appreciated! Any information about how your friend is growing it? Is it possible he is over watering or using mineral rich tap water etc? 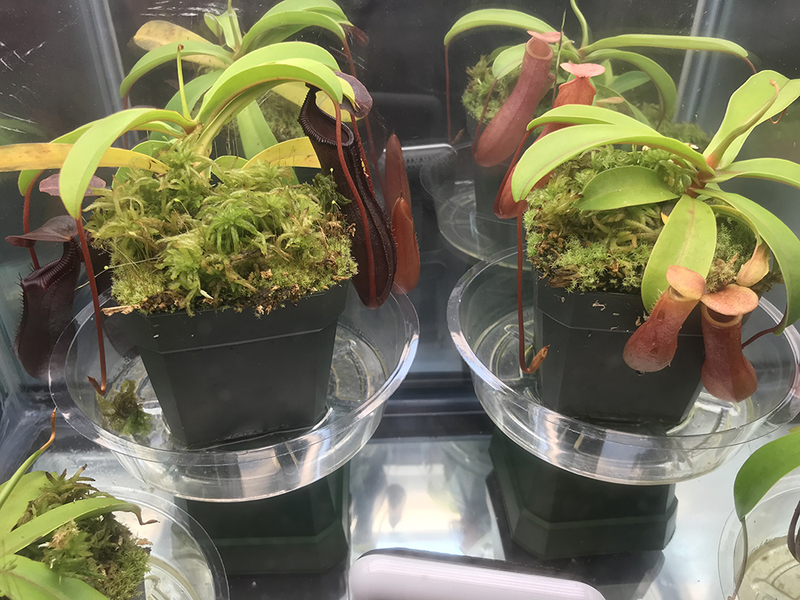 I have never had a nepenthes do that, so I am not the expert at all to ask, but seeing as you weren’t getting any responses I wanted to at least get the conversation started on what all the conditions are that the plant is being cultivated in. Any info you can share would help the most. It doesn't look too good. My guess would be that it is getting too much direct sunlight. The leaves also look a bit wilted which makes sense that it would be drying out in the sun. If your friend could find light that is more indirect and give the plant some more water/humidity, then it could be saved. Agreed, with Zcons. Knowing he may have let it dry a bit makes sense. Maybe put a shallow water tray under it and let it fill up halfway. Then have him let the tray dry out before watering again until the tray is halfway filled up. Much easier to keep a nep wet enough without worrying when you let the tray dictate when it needs it again. Another note is that live sphagnum Moss is a good indicator of getting too dry before the plant suffers. Add live sphagnum to it and when it starts looking dry give it an easy top watering and let it drain. Do it again next time the moss looks drier. Good luck to him! The nep can come back. I see a plant sitting on a windowsill, with a heater/radiator immediately below the sill. That tells me the plant is likely experiencing a mix of hot and cold draughts as the heater comes on and off. The heat is likely also drying the air excessively (I bet the RH is below 30%) and that is about as Nepenthes-unfriendly as it gets. Keep in mind these are wet, cool rain-forest plants that normally experience near-100% humidity 24/7 and temperatures that swing between 45F and 75F. (Often less than 70F) The lack of humidity can be extremely damaging to Nepenthes. Fix that first, and address the hot/cold draught. Scary Mary... just in time for Halloween!